He doesn’t soft-peddle his approach. In another airplane press conference on an apostolic journey abroad, Francis called out anyone who commits violence in the name of religion. And while he emphasized the importance of free expression, he admitted it necessarily has limits. Secondly, you cannot offend or make war, kill in the name of your religion, in the name of God. What has happened now astonishes us…Killing in the name of God is an aberration against God. I think this is the main thing with freedom of religion. You can practice with freedom without offending but without imposing or killing. The freedom of expression… Every one of us has not just the freedom, the right, but also the obligation to say what he thinks to help build the common good. The obligation. If we think of a congressman, a senator, if he doesn’t say what he thinks is the true path, he doesn’t collaborate in the common good. We have the obligation to freely have this liberty, but without offending. It’s true that you cannot react violently. But, if Dr. Gasbarri, my great friend, says something against my mother, he can expect a punch. It’s normal. It’s normal. You cannot provoke, you cannot insult the faith of others, you cannot make fun of the faith. Pope Benedict, in a speech, I don’t remember which, he spoke of this post-positivist mentality, of the post-positivist metaphysics that brought people to believe that religions or religious expressions are a type of lower culture: that they are tolerated but that there’s not much to them, that they are in not part of an enlightened culture. And this is a lecacy of the Enlightenment. So many people speak against others’ religions. They make fun of them. Let’s say they “giocatalizzano” (make a playng out of) the religion of others. But they are provoking, and what can happen is what I said about Dr. Gasbarri if he says something about my mother. There is a limit. Every religion has dignity; I cannot mock a religion that respects human life and the human person. And this is a limit. I’ve used this example of the limit to say that in the freedom of expression there are limits, like the example I gave of my mother. I don’t know if I was able to respond to the question. Thanks. This is so Francis-like. Honest and sincere, off-the-cuff spontaneous remarks, in the colloquial expressions he’s familiar with but we all are too, in our own way. So we can relate. Would you hear Pope John Paul II or Benedict talking about ‘expecting a punch’ for insulting his mother? No. But Francis is Francis. Catholics refer to ‘Holy Mother Church’, which was a point he was making. Freedom of expression is important, but all freedoms have to be exercised within the limits of truth, right order and the common good (think ‘You can’t yell fire in a crowded theater’). More on his thoughts about religion being abused in the cause of war here. I support efforts to find the truth, balance efforts; not those in search of vindication, but balanced efforts to help to reach an agreement. I heard something from the President of Sri Lanka – I don’t want this to be interpreted as a political comment, it is only phenomenological: I repeat what I heard and I agree with. He said he wants to move ahead with the work of peace, reconciliation. Then he used another word, he said we must create harmony in the people. That’s something more than peace, more than reconciliation, and it’s beautiful, it’s musical, too. Then he used another word. He said harmony brings happiness and joy. I was amazed. I said: I like hearing this, but it’s not easy. He said yes, we must touch people’s hearts. That’s what I thought of in answering your question, only by touching the hearts of people who know what suffering is, what injustice is; who had suffered many things from war, so many things. Only by touching hearts can people forgive, can we find the right path, without incorrect compromises to go forward. This all comes right after the week of terror in Paris and the extraordinary weekend unity rally that drew world leaders and massive crowds together in a demonstration of solidarity against extremist violence. Francis has been working on that, through the channels available to him, throughout his papacy. In the footsteps of his predecessors, according to former US Vatican Ambassador Francis Rooney, who wrote this Time.com opinion piece not long ago, which becomes timely again with current events. 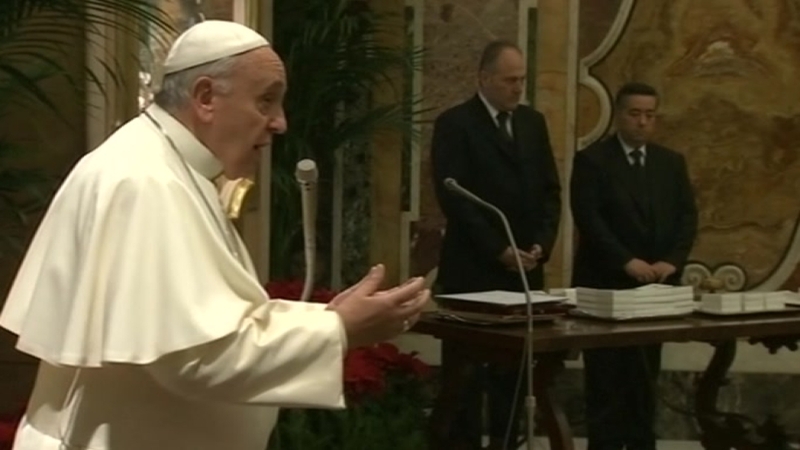 It has now been announced that Pope Francis will make a state visit to Turkey in November [which he made]. As with Pope Benedict’s visit there in 2006, a papal visit to the secular Islamic nation will garner the attention of everyone who is concerned about the violence and civil wars in the Middle East. Like the Albania visit, the Pope’s very presence will symbolize hopes for genuine religious tolerance and inter-religious dialogue, while drawing the clear distinction between religion and lawlessness and murder. Following Regensburg, several groups of Islamic scholars acknowledged that Koranic teaching must reconcile with modernity. Few people know that fact, to this day. Pope Francis’ engagement of the Holy See, both in calling for an end to the persecution of Christians and implying recently that even military opposition to ISIS in Iraq and Syria could be supported a “just war,” has similarly brought constructive results. …Grand Mufti Abdul-Aziz, the leading Muslim cleric in Saudi Arabia, spoke out clearly against radicalism in response to King Abdullah’s public request for all clerics to raise their voices on this issue. While King Abdullah visited Pope Benedict in the aftermath of Regensburg, this is the most clear expression of Saudi opposition to radicalism to date. George Weigel has recently summarized the problem and suggested a solution, stating that the modern world is at a crossroads with Islam, which requires that Islam reconcile its theology with the tolerance, freedom and respect for human life that the rest of the civilized world has come to expect, as well as with the nature of the secular, modern state and its relationship to religion. While optimism is hard to find right now, and the violence and persecution in the Middle East and parts of Sub-Saharan Africa continue unchecked, these recent expressions offer promise that a broad community of nations will congeal to create a supportable, “just” force against Islamic extremists and that the Muslim states and leaders themselves will work to devise theological and philosophical constructions to bring Islam at large into accord with the modern world. No sovereign is more aligned with these efforts nor more suited to weigh in diplomatically than the Holy See and Pope Francis. In a split decision, the majority upheld the tradition of the US since its founding. A divided Supreme Court ruled Monday that legislative bodies such as city councils can begin their meetings with prayer, even if it plainly favors a specific religion. The court ruled 5 to 4 that Christian prayers said before meetings of an Upstate New York town council did not violate the constitutional prohibition against government establishment of religion; the justices cited history and tradition. “Ceremonial prayer is but a recognition that, since this Nation was founded and until the present day, many Americans deem that their own existence must be understood by precepts far beyond the authority of government,” Justice Anthony M. Kennedy wrote for the court’s conservative majority. This was an important test, yet again (a previous one being Hosanna-Tabor) of the true provision for the free exercise of religious liberty in America by the Founders. The ruling reflected a Supreme Court that has become more lenient on how government may accommodate religion in civic life without crossing the line into an endorsement of a particular faith. All nine justices endorsed the concept of legislative prayer, with the four dissenters agreeing that the public forum “need not become a religion-free zone,” in the words of Justice Elena Kagan. However, since everything is so political and partisan these days, there’s a clause to follow. But there was sharp disagreement after that, and the majority ruling could encourage public bodies to give more leeway to religious expression in their ceremonial prayers and less deference to the objections of religious minorities. The court’s five conservatives said legislative prayers need not be stripped of references to a specific religion — the prayers at issue often invoked Jesus Christ and the resurrection — and said those given the opportunity to pray before legislative meetings should be “unfettered” by what government officials find appropriate. “Absent a pattern of prayers that over time denigrate, proselytize, or betray an impermissible government purpose, a challenge based solely on the content of a particular prayer will not likely establish a constitutional violation,” Kennedy wrote. Once again, as is usually at issue in these court cases, the complaint was that the prayers tended to be Christian. And in this case, it was alleged that the opening prayer might somehow coerce everyone in the courtroom to hold a certain belief, or prejudice or intimidate those involved in grievances up for consideration before the governing body. Kennedy began by referring to history: The same founders who wrote the First Amendment — with its prohibition on the establishment of a government religion but also protections for religious liberty — provided money for congressional chaplains, he said. “Legislative prayer has become part of our heritage and tradition, part of our expressive idiom, similar to the Pledge of Allegiance, inaugural prayer, or the recitation of ‘God save the United States and this honorable Court’ at the opening of this Court’s sessions,” he wrote. The court’s majority split on how to judge whether prayers amount to coercion of nonbelievers. “The analysis would be different if town board members directed the public to participate in the prayers, singled out dissidents for opprobrium, or indicated that their decisions might be influenced by a person’s acquiescence in the prayer opportunity,” Kennedy wrote in a part of the opinion joined only by Roberts and Alito. Still, the religious divide was stressed in the case and the reporting of it. But David Cortman, senior counsel for the Alliance Defending Freedom, praised the ruling. It’s most interesting to recall that the Supreme Court unanimously agreed in Hosanna-Tabor that the State has no right to interfere in long established and protected matters of religious freedom. But building to the high court’s decision on the HHS mandate severely restricting that right, a decision expected by June, this case is only adding to the drama building around that decision. As they say in politics, the optics are bad in this one. A legal expert on my radio show this week said their firm, extensively involved in lawsuits against the administration’s HHS mandate, said they were frankly surprised that the administration continued to push forward on the unprecedented mandate after the 2012 election at all, much less pushing it vigorously and committing teams of lawyers to defending it in courts across the country in 91 different lawsuits representing institutions, corporations, small business owners and individuals. But they have. It was always destined to go to the Supreme Court, and will in March, since the high court decided to hear two key cases involving what some call the ‘contraceptive mandate’ and others the ‘contraception delivery scheme mandate’. It’s stayed off the public radar for the most part, largely due to media ignoring it and Americans being inundated with so many other cases of big government overreach, in other areas. That hasn’t stopped the vigorous movement to hold off, reverse, overturn, or declare unconstitutional the Obamacare HHS mandate. It’s all here. Including the New Year’s Eve ruling by Supreme Court Justice Sonia Sotomayor in favor of the Little Sisters of the Poor, who were hesitant to even go to court, their lawyers tell me. They’d rather be doing everything they’ve done for 175 years to take care of the sick, elderly, dying, and just caring for people. They didn’t want this fight. But they won’t give up on it the way they never give up on the sick and needy. 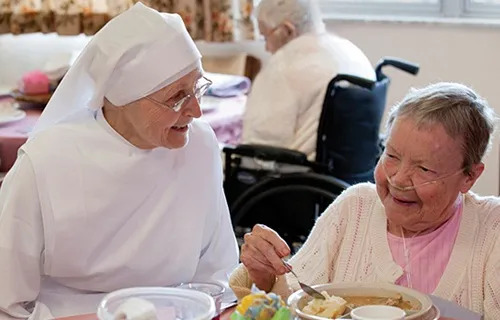 The Little Sisters of the Poor run a nonprofit Colorado nursing home and hospice and therefore ought to be exempt under what the White House calls its “accommodation” for religiously affiliated institutions like parochial schools, hospitals and charities. The problem is that to qualify under the “accommodation,” religious organizations must sign a legal contract with their insurer certifying that the religious organizations refuse to subsidize contraceptive services. “This certification is an instrument under which the plan is operated,” the contract notes, then informs the insurer of its “obligations” under the rules. Those include a command that the insurer “shall provide” contraception to all enrollees, supposedly independently and for free. The political point of the accommodation was to pretend that the costs of contraception or abortifacients are nominally carried by a third-party corporation, but the insurers are really only the middle men. The Little Sisters thus argue that signing the certification contract directs others to provide birth control in their place and makes them complicit. Boiled down, the Justice Department’s legal response on Friday was: Shut up and sign the form. Yes, ‘it’s just a piece of paper,’ they contended. Within hours, dozens of news stories appeared online that put the sisters at the center of a contentious national debate on what constitutes strong-arming a religious congregation to provide contraceptives and other abortion-inducing drugs to its employees. The sticking point for both sides is a waiver/authorization form that the Little Sisters must fill out to take advantage of a so-called accommodation for non-profit ministries. The form, however, has a dual purpose—it signals opposition to the mandate, but also authorizes a third-party to provide the services it finds morally objectionable. If the sisters don’t sign the waiver/authorization form, or if the courts don’t uphold the injunction, they could be subject to devastating IRS penalties that could add up to millions of dollars a year. As Fr. Dwight Longenecker notes, we’ve seen this scenario before. Where have we heard this before? Henry VIII and the Act of Supremacy. In November 1534 the English Parliament decreed that King Henry VIII was the “only supreme head on earth of the Church of England.” Everyone who held public office had to take the oath of supremacy, and most did. After all, it was “only a few words…only a pen stroke if you like…only a piece of paper.” At first the authorities even made it easier for people with tender consciences. A clause was added to the claim that the king was the head of the church: “insofar as the law of God allows.” Many of the clergy took the oath while they kept their fingers crossed with the compromise clause. Once they got most to comply the compromise clause was removed. Those who had compromised now found that they had sworn the oath in the original form and they were held to it. When Henry’s illegitimate wicked daughter Elizabeth came to the throne the Oath of Supremacy was extended to schoolteachers, local authorities, university students–virtually anyone in any position of authority. To refuse to take the oath was treason, and the oath was demanded by the officers of Elizabeth’s police state. The issue here is of the tactics used to suppress opposition. An oppressive government will insist that those with religious objections conform. They will say, “It is only a piece of paper. It is a mere pen stroke. What harm can there be in taking this way out we have offered you?” However, if it is a mere pen stroke or only a piece of paper, then why does the government insist on conformity of the Little Sisters of the Poor? If it is only a piece of paper or a pen stroke, why bother? Because it is most assuredly not a mere piece of paper or a pen stroke. It is the violation of the sister’s conscience by the government authorities. Why does the federal government insist on this detail? Because they know that if one group is allowed to have an exemption on religious grounds, then all groups may claim a similar exemption because of religious beliefs. Archbishop Joseph Kurtz, newly elected head of the US bishops conference, the body which found unusual unanimity in standing against this violation of religious freedom and basic conscience rights, explains. Our faith calls us to put first the needs of our brothers and sisters who suffer in poverty, and Catholics are justly proud of our network of schools, hospitals and social service ministries that work every day to help the poor and vulnerable. Yet the ability of these ministries to live out the fullness of our faith is in jeopardy. The mandate from the Department of Health and Human Services forces countless Catholic schools, hospitals, and social service organizations to participate in providing employees with abortifacient drugs and devices, sterilization, and contraception in violation of Catholic teaching. The mandate went into effect on Jan. 1; ministries now are faced with the choice of violating our deeply held beliefs or paying crippling fines. If these ministries don’t comply, the financial penalties may mean that some may have to close their doors. As that happens, the poor and those who serve them will be hurt the most. Forcing our ministries to divert funds from serving their neighbors to paying government fines will have real consequences for real people. Archbishop Kurtz, a wise, kind, gentle and devoted shepherd, is trying to strike the right balance while serving needs justly. We have spent significant time and effort seeking sincere dialogue with the Obama administration in hopes of preventing this impasse, and we are long-standing advocates of accessible, life-affirming health care. Yet our concerns continue to go unheard. The administration has crafted an “accommodation” that continues to compel our ministries to participate in providing drugs and services that violate our deeply held religious beliefs. With the implementation date now upon us, we have made one more effort at dialogue, again asking President Obama to exempt nonprofit institutions caring for those in need from the harsh penalties imposed by the mandate. The administration has shown flexibility in implementing other provisions of the Affordable Care Act, issuing numerous delays and exemptions for many employers and individuals. On behalf of those served by our schools, hospitals and social service ministries, we will continue to resist the burdens imposed by the HHS mandate. We hope and pray that the administration and Congress will protect us from those burdens, and that the courts will uphold our freedom to serve those who depend on us. Some members of Congress are trying, relentlessly, to protect conscience rights and religious freedom. They need support and encouragement. Though everything is not political, everything is made political. In that world, the term ‘optics’ is often applied to actions that will be reported on and judged by the public. The Little Sisters of the Poor in court seeking protection from administration lawyers is not good optics. To say the least. Few knew she suddenly ruled against Obamacare’s HHS mandate. But they sure noticed her dancing in Times Square that night. Nobody knew it was coming. So how odd it was to see the breaking news that Justice Sonia Sotomayor had just ruled to delay the Obamacare birth control mandate in th e waning hours of New Year’s Eve. Sotomayor acted on a request from an organization of Catholic nuns in Denver, the Little Sisters of the Poor Home for the Aged. Its request for an emergency stay had been denied earlier in the day by a federal appeals court. The government is “temporarily enjoined from enforcing against applicants the contraceptive coverage requirements imposed by the Patient Protection and Affordable Care Act,” Sotomayor said in the order. Sotomayor, who was in New York Tuesday night to lead the final 60-second countdown and push the ceremonial button to signal the descent of the Times Square New Year’s Eve ball, gave government officials until 10 a.m. EST Friday to respond to her order. I see this not three hours before that midnight ball drop in Times Square, not knowing she’s there. I’m watching Twitter and Facebook and online news sites erupt with word about the ruling. And then I see her dancing in Times Square. Tonight the Little Sisters of the Poor received a temporary injunction from the Supreme Court protecting them from the controversial HHS contraceptive mandate. The injunction means that the Little Sisters will not be forced to sign and deliver forms tonight authorizing and directing others to provide contraceptives, sterilizations and drugs and devices that cause abortions (see video). In fact, one expert told me Monday that he had expected the administration to drop the thing after winning the 2012 election, and admitted surprised that they’re as dug in as they are in pressing something so oddly ungrounded and without any merit whatsoever. The Chicago Tribune editors published this editorial following Sotomayor’s ruling. The administration has set out a complicated standard for whether a company or organization should be exempt from these rules. On one end stand for-profit corporations, which aren’t exempt. At the other end, churches and some other religious institutions, which are excused. In the middle are many groups that have a religious affiliation and a faith-based mission, such as Catholic-affiliated universities and hospitals, and the Little Sisters of the Poor in Colorado. Earlier this week, Archbishop Joseph Kurtz, the head of the U.S. Conference of Catholic Bishops, complained in a letter to Obama that while the administration had “relaxed the rules” for many Americans’ health plans, “one category of Americans … has been left out in the cold: Those who, due to moral and religious conviction, cannot in good conscience comply” with the contraception mandate. The administration has made numerous exceptions to the rules of Obamacare — including delay in the insurance mandate for employers and many individuals. About a year ago, the Department of Health and Human Services announced it would draw a distinction between religiously affiliated employers and secular employers. But it still sought a guarantee that their employees would have contraceptive coverage. We’re not arguing against insurance coverage of contraceptives. But a government mandate that religious organizations violate the tenets of their faith is an unconstitutional reach. Right. As they conclude, Obamacare is the law of the land. But the constitutional protection of religious freedom is more deeply and historically embedded in this country’s foundation, and there’s no defensible reason why it might be denied – or even challenged – now. The general public and the media are finally dealing with the reality of Obamacare. Great numbers of Americans have a nearly two year jump on that process. To recap what many people probably forgot, the infamous HHS mandate was announced in January 2012, a throwdown to faith based institutions and employers requiring them to either violate their consciences or pay a prohibitive penalty. It signaled the government’s disregard for Constitutional and federal law protecting religious freedom rights. And it triggered an almost immediate response of legal challenges to the administrations’ audacious breach of those rights. To date, this unconstitutional mandate in Obamacare has racked up 77 court cases with over 200 plaintiffs bringing suit against the administration. Most of which has flown under radar while the press wasn’t paying attention and Americans were going about their business. Except for the Americans who couldn’t conduct their business any longer without violating their conscience and deeply held beliefs, or paying a punitive fine for refusing to do so. That’s right. The administration’s attorneys argued that when people enter into business, they check their religious freedom rights at the door. Breathtaking, really. Precisely. And that court said as much earlier in this case. In January, the 7th Circuit issued an order in Grote Industries v. Sebelius that temporarily stopped enforcement of the mandate until appeals could be resolved. I happened to plan Wednesday’s radio show this week as an update on the HHS mandate lawsuits, given all the news on that front lately while the rest of America has been focused on the other drastic consequences of Obamacare. Besides lead counsel Matt Bowman updating that 7th Circuit Court decision, I had Prof. Dwight Duncan on as a guest on constitutional law and the HHS mandate, the author of this article on religious freedom who most recently filed an amicus brief in the DC Circuit Gilardi decision that struck the mandate. Prof. Duncan said it’s not up to judges and to government to decide if something violates Catholic moral teaching, it’s up to clergy and theologians to decide what’s moral, and that’s where the Religious Freedom Restoration Act kicks in. That federal, bi-partisan law passed under the presidency of Bill Clinton requires the government to prove a compelling interest in violating religious freedom rights, and that it’s going about it in the least restrictive means possible. This administration under this mandate can’t meet either of that two-pronged test. The hour before the radio show went on the air Wednesday, the US bishops conference wrapped up their Fall meeting and released a ‘Special Message‘ on the HHS Mandate, reinforcing their commitment to defending and protecting religious freedom for institutions, employers and individuals in spite of government mandates that violate them. That statement played into discussions with both legal experts Matt Bowman and Dwight Duncan on the show that day. But Thursday, Baltimore Archbishop William Lori, chairman of the committee on religious liberty for the US bishops, took time to come on the radio show to talk about that statement on the HHS mandate. Here’s what Archbishop Lori said on my radio show. “We’re determined to continue our ministries according to the Gospel of our faith. This is an important message to send, and important to send it unanimously. The big problem with the HHS mandate is that it’s the government dividing up our ministries. If you’re serving the public, you have to play by rules other than your own. That’s a fundamental problem and a great burden on our religious liberty. “I do believe we’ve raised a lot of awareness of a lot of Catholics, underneath there’s a ground shift in our ability to provide educational services, healing services. The government says we have to provide things that go against our beliefs and go against human dignity. It’s a difficult climate in Congress to get beyond the partisan labels. But we’re not coming at this from a partisan point of view, it’s fundamental. “Since 1919, the bishops have been on this, saying accessible health care has been a really important thing for people everywhere. We have certainly have been willing and able to advance that everywhere. Our hospitals and health clinics do untold amounts of uncompensated health care every year. And in the pursuit of this very laudable goal, we find ourselves sidetracked by this mandate, absorbing our time, absorbing our resources, when in fact we would prefer to put that same time and energy into serving the poor and the needy. “How ironic that when the government decides to do accessible health care it decides to put one of its staunchest allies in its sights. The Catholic Church is the largest provider of health care, social services and education. We seek to answer the Gospel call to serve our neighbors, meet our obligation to provide our people with just health insurance, protect our religious freedom, and not be coerced to violate our consciences. We remain grateful for the unity we share in this endeavor with Americans of all other faiths, and even with those of no faith at all. It is our hope that our ministries and lay faithful will be able to continue providing insurance in a manner consistent with the faith of our Church. We will continue our efforts in Congress and especially with the promising initiatives in the courts to protect the religious freedom that ensures our ability to fulfill the Gospel by serving the common good. It’s just one of the fallouts of Obamacare, and the one long forgotten by some. But it has endured and will, in the effort of Americans committed to do good works informed by faith and moral principles in serving people in need, without coercion by government. And by the way, this mandate is inevitably headed to the Supreme Court. Foremost among the rights Americans hold sacred is the freedom to worship as we choose. Right there is a tip off to where his administration has been going with religious liberty in America, transitioning it to the freedom to worship. Today, we celebrate one of our Nation’s first laws to protect that right — the Virginia Statute for Religious Freedom. Written by Thomas Jefferson and guided through the Virginia legislature by James Madison, the Statute affirmed that “Almighty God hath created the mind free” and “all men shall be free to profess . . . their opinions in matters of religion.” Years later, our Founders looked to the Statute as a model when they enshrined the principle of religious liberty in the Bill of Rights. Because of the protections guaranteed by our Constitution, each of us has the right to practice our faith openly and as we choose…Americans of every faith have molded the character of our Nation. They were pilgrims who sought refuge from persecution; pioneers who pursued brighter horizons; protesters who fought for abolition, women’s suffrage, and civil rights. Each generation has seen people of different faiths join together to advance peace, justice, and dignity for all. Define “all,” because different faiths have joined together over several decades to advance rights that don’t apply to the entire class of human beings who exist in the mothers’ wombs but are as yet unborn, and over most of 2012 to advance rights that are being denied employers who morally object to his HHS mandate. People who are battling in courts across the country to defend “the right to practice our faith openly and as we choose”. As we observe Religious Freedom Day, let us remember the legacy of faith and independence we have inherited, and let us honor it by forever upholding our right to exercise our beliefs free from prejudice or persecution. The Becket Fund for Religious Liberty issued this statement soon after the Proclamation was released. So again I’m left wondering whether the president hears his own statements and considers them. Because actions speak louder than words, and his are saying contradictory things. It was always wrong. But because it was issued by executive fiat, its violation of law had to go through the process of being tried, and there are many lawsuits standing against it. This one scored a victory. Today, a federal appeals court in Washington, D.C. handed Wheaton College and Belmont Abbey College a major victory in their challenges to the HHS mandate. Last summer, two lower courts had dismissed the Colleges’ cases as premature. Today, the appellate court reinstated those cases, and ordered the Obama Administration to report back every 60 days—starting in mid-February—until the Administration makes good on its promise to issue a new rule that protects the Colleges’ religious freedom. Health and Human Services Secretary Kathleen Sebelius cannot enforce the Obamacare contraception mandate as it is written, but must follow through on a promise to rewrite the rule to accommodate religious liberty, a federal appeals court ordered. The Obama administration “represented to the court that it would never enforce [the mandate] in its current form against the appellants or those similarly situated as regards contraceptive services,” the three judges hearing the case wrote in their order. The Obama team made that promise during oral arguments against Wheaton College and The Becket Fund for Religious Liberty, which sued over the contraception mandate but lost at the lower court level. “There will, the government said, be a different rule for entities like the appellants . . . We take the government at its word and will hold it to it,” the judges wrote. They ruled that the Obama administration must rewrite the regulation by August 2013 and provide updates to the court every 60 days. If the government fails to do so, the lawsuits may proceed. The court also noted that the Obama administration had not made such an expansive pledge outside the courtroom. Yesterday’s ruling marks the second time in two weeks that a judge has decided that Obama’s promise to change the rule eventually is an insufficient remedy to the religious liberty issues raised by opponents of the mandate. It’s about time it gets applied. The presidential candidates are making their closing arguments, racing around the States, and especially the swing states possibly still in play, along with their top surrogates. Church leaders are making their final appeals, turning out pastoral statements and letters to reach all the citizens in their dioceses and parishes, with the help of priests and ministers. It’s time for the most consequential vote of our lifetime, as many politicians, scholars and historians have called this election. It’s no surprise that it comes out of a gasping sprint by the candidates. Why it winds up being nearly a 50-50 split going into election day is a study in contemporary power politics of social agenda over party principle. The Democratic National Convention in August sealed that deal, with the platform committee rejecting any input from Democrats for Life and changing the Clinton reference to the desire for abortion to be ‘safe, legal and rare’ to just ‘safe and legal.’ After all, Jonathan Last told me on radio, suggesting that something like abortion be ‘rare’ implies a moral judgment of some sort. Any such implication was no longer tolerable to the party of tolerance. The thing that struck me most about Monday, November 5th 2012, the day before this historic election, is that nearly every single pundit, analyst, historian and other expert I saw and heard interviewed on television and radio eagerly and nervously claimed no ability to decipher the data coming in from the country’s pollsters enough for a confident prediction of Election 2012’s outcome. Some of the older and wiser and most highly reputed ones were most vocal in their claims that this election was beyond the call. So on the eve of it, we were facing…anything. A landslide had become a remote likelihood, but the extremes became more like whether we’d know the results by Wednesday, to whether we’d be locked in a recount into December, to whether the electoral college would have to split the decision for president and vice-president between the Senate and the House of Representatives. Which makes Election Day all the more tense, exciting and nerve-wracking. We’ve seen last minute fluctuations in support, like the New York Daily News. The endorsement also ticks off a list of reasons for why the daily tabloid is backing Romney in 2012 – including smaller paychecks, fewer jobs and higher subway fares and gasoline prices. Beyond the rhetoric, the paper backs up its decision with a salvo of numbers after the 2008 financial crisis – including a 7.9 percent national jobless rate and nine million fewer jobs. The paper also points out the hometown crowd, with some of the most well-educated and well-paid residents in the country not spared. The median household income for a New York family dropped by $54 a week over that period, the paper also points out. The Daily News joins nearly a dozen other major U.S. newspapers in switching endorsements from Obama to Romney, according to the University of California, Santa Barbara’s American Presidency Project. And the Wisconsin State Journal. Not enough hope and too little change. That is President Barack Obama’s record on the economy, debt and Washington gridlock after four years in the White House. The State Journal editorial board endorses Mitt Romney in Tuesday’s presidential election. Romney showed as the Republican governor of Democratic-leaning Massachusetts that he can find agreement across the partisan divide. And his vice presidential pick — Wisconsin’s U.S. Rep. Paul Ryan, R-Janesville — suggests Romney is serious about tackling America’s fiscal mess. Romney has an impressive record of success in the private and public sectors. He’s a numbers guy who focuses more on results than ideology. That’s why so many of his fellow Republicans during the GOP primary criticized him for not being conservative enough. Romney has been a strong leader in business and civic life. This includes turning around many troubled companies and the 2002 Winter Olympics. Romney better understands how and why entrepreneurs and employers decide to expand and add jobs. He’s more likely to get the private-sector going strong again. Of course, the disclaimers are there as well. Marriage redefinition, abortion rights, Obama’s likeability, George W. Bush’s fault for what Obama inherited, deflected praise for killing bin Laden. It’s a weak editorial, but it comes down endorsing change, this time in Mitt Romney. On Monday, over 500 former Generals and Admirals took out a full page ad in the Washington Times to endorse Mitt Romney. GEN Franks is probably best known as the commander of US Central Command (CENTCOM) from 2000 to 2003, during the war that ended the reign of Saddam Hussein in Iraq. He was appointed to head up the Middle East-centric command by President Bill Clinton and assumed command of CENTCOM on July 6, 2000. Franks served in the United States Army from 1967 to his retirement in 2003. GEN Henry Shelton served as Chairman of the Joint Chiefs of Staff under President Clinton from October 1, 1997 to October 1, 2001. Shelton’s military honors include the Purple Heart and the Bronze Star with valor device and three oak leaf cluster. He also commanded the United States Special Operations Command. The full-page ad says “We, the undersigned, proudly support Governor Mitt Romney as our next President and Commander-in-Chief.” A note at the bottom of the ad says that the officers all paid for the ad themselves. The list includes officers who served in the United States Army, the United States Navy, the United States Marine Corps, and the United States Air Force. Meanwhile, Catholic bishops and scholars have made their final cases for the election. There are far too many to cite, but the Pennsylvania bishops’ statement gets to the heart of it all. The 2012 elections take place during the Year of Faith. As Pope Benedict XVI explains, this year is necessary because, while many people continue “to think of the faith as a self-evident presupposition for life in society,” nevertheless “in reality, not only can this presupposition no longer be taken for granted, . . . it is often openly denied” (Porta Fidei, no. 2). Today it is no longer the case, as it was for our country’s Founders, that religion can provide a shared moral framework and vocabulary for a pluralistic democracy. This is a key point. Re-read that last point and pay attention to the next one. In fact, Americans would do well to realize that many of our country’s leading thinkers in law, higher education, and the social sciences simply no longer believe in the idea of inalienable natural rights guaranteed by a Creator higher than the State—one of the cornerstone principles of the American experiment. This has serious implications because many of our most urgent political issues—ranging from the economy, immigration, and abortion to global security—raise profoundly moral questions. These questions cannot be resolved without a common understanding of right and wrong. Right. That’s evident in most ‘comments’ sections of news sites and blogs these days. How do you reason with people who don’t resort to reason? Consider today’s aggressive efforts to redefine the nature of marriage, to exclude parental authority in the choice of the best education for their children, and to force Catholic healthcare and social services to end their ministries unless they violate their religious identities through mandated support of practices contrary to the very sanctity of human life. Religious liberty itself—“our first, most cherished freedom”—is no longer secure. At first glance, this may seem otherwise because religious freedom is so deeply ingrained in our national history. But democracy has no special immunity to losing its soul by little steps. As Alexis de Tocqueville, the great chronicler of early American democracy, observed more than 150 years ago, “it is especially dangerous to enslave men in the minor details of life”—because the more the state provides, the more it inevitably controls. Scholar George Weigel completes, or at least adds to, a series in First Things on Campaign 2012 with this commentary on What Voting Means. Morally serious voters understand that casting a ballot is not an exercise in nostalgia, and that gratitude to FDR for giving grandpa a job in the Civilian Conservation Corps, or fond memories of the Eisenhower years, cannot be determinative of one’s moral judgment about the American future, and those who would lead us into it, in 2012. Morally serious voters understand that the character of political parties changes over time, and that voting for the Democrats or the Republicans because “that’s what we’ve always done” is outsourcing one’s moral judgments to others. Morally serious citizens recognize that voting a straight party line is an abrogation of moral responsibility, because the judgment one makes of a party’s candidate for, say, president, cannot be applied willy-nilly to that party’s candidate in House or Senate races. Morally serious Catholics recognize that no one party in contemporary America fully embodies Catholic social teaching; but alert Catholics will also take notice when a party holds Catholic social teaching—including the Church’s teaching on such fundamental issues as the inalienable right to life and the nature of marriage—in contempt. Denial of religious liberty and conscience rights goes beyond constitutional violation. It’s a matter of the common good and generational ethics. Voters who think only of themselves, and do not take into account what kind of country their children and grandchildren will inherit, are being politically shortsighted and morally obtuse. Voting is not simply a privilege; it is a noble privilege, because it asks each of us to bring our best judgment to bear on matters of grave consequence. God help us make the right decision. That floor fiasco over the party platform was reported as the Democrats ‘booing God.’ Which is only partially true. Some of the booing was over the platform amendment changing the reference to Israel, though the amendment covered both and caused a floor fight. Which, as everyone paying attention to this stuff at this point knows well by now, went weirdly through multiple stages of negative statements, followed by denial and charges of misreporting, followed by evidence that the reporting was accurate which led to spin of the original point all along. Followed by the floor vote on the amended wording in the platform. Anderson Cooper openly mocked the Democrats’ attempts to brush past the controversy surrounding changes to its platform on Wednesday night. Democratic National Committee chair Debbie Wasserman-Schultz appeared on the network to discuss the rancorous opposition to the insertion of new language about God and Jerusalem into the platform. Wasserman-Schultz told her interviewer Brianna Keilar that there had been “no discord” when the platform was amended. It was an audacious statement to anyone who had seen the footage of the boos and shouts that came when the amendments were proposed — as well as the fact that convention chair Antonio Villaraigosa had to try three times before he got a result he was satisfied with. Right. The party doesn’t entirely know what it stands for, but in its official statement it claims to stand for more radical ideology than Democrats in recent history ever did. Connect the dots. The week opened with that welcoming video saying that “government is the only thing we all belong to.” It was Orwellian. Fast forward through all the celebration of abortion, with all the shouting and yelling about reproductive rights, and the sanctimonious spin about gay marriage and the complete lack of reference to the battle for religious freedom, and you get to the platform fight over adding the mention of God. That’s directly connected to the rest. First thought I had was of the EU hammering out a constitution and two popes imploring Europeans and their leaders not to rewrite history and deny their Christian heritage and reject their very identity. Fortunately, Dr. Paul Kengor had the same thought and expressed it with keen insight. The God opponents were the predictable Western European progressives: leftist Eurocrats in Brussels, Labor Party atheists in Britain, German socialists, Scandinavian secularists, and, naturally, the French leadership. The God supporters included new EU member states that survived godless communism—with Poland in the forefront—and the continent’s preeminent religious figure: Pope John Paul II. That the Democrats, in 2012, would find themselves in a similar battle is no surprise. By the time of the 2012 Democratic convention, party delegates had already (following Barack Obama’s lead) embraced everything from unlimited taxpayer-funding of abortion to gay marriage. How does one get to these positions? Answer: by removing God. Fittingly, then, the delegates merely need to take the next evolutionary step: exclude God. The heads of that party have been making strident moves to do that in a number of ways, but nothing as brazen and sweeping as the HHS mandate that by federal fiat relegates religiously informed consciences to powerlessness, and religiously run businesses, insititutions and social ministries to the morally bankrupt position of being neither able to practice or preach what they believe. The fact that the practially non-existent ‘accommodation’ is so narrow it wouldn’t even apply to Jesus is not an unintended consquence.